Baltimore Orioles sure do light up the backyard! They are hitting the grape jelly really hard now. I think they're fattening themselves up for migration. By the time winter arrives, they have to get to a warmer climate. 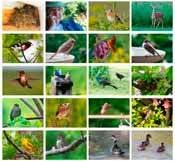 Most of them will winter in Cuba, Jamaica, southern Central America, and northern South America. I love thinking of where they've been when they return to us in spring. If you're in Florida or coastal southern California, you can enjoy them in the winter there. Other than those places, it's rare to see them in the US in winter. We have had Baltimore Orioles come to feeders for hulled sunflower seeds, but that's unusual. What they really like is grape jelly. So that's what we give them. Especially in the spring and in the late summer or fall, like now. 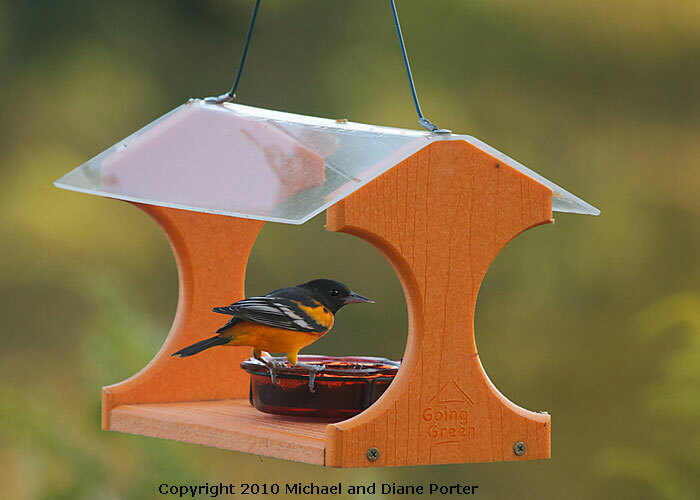 The feeder is made especially for offering jelly to orioles. It's made out of recyled plastic. I'm glad to see some old bottles going into a useful form instead of taking up space in the landfill. One of the best buys of all the mid-sized binoculars is the Vortex Fury 8x32. We recently reviewed 34 mid-sized binoculars, and this one beat out binoculars costing over $1000! This feeder stays nice, doesn't warp or crack, is completely washable, and is made from plastic bottles that otherwise might have been added to the landfill.